There were seconds left to play in the Réseau du sport étudiant du Québec provincial championship rugby game on Saturday and the Stingers were trying to mount a comeback. Ottawa won their second straight women’s rugby provincial championship, 25-17 over the Stingers, who have now lost the provincial title game three straight times. Concordia applied pressure to their opponents, the Ottawa Gee-Gees, and made it all the way to the try line. It appeared, from the stands, that they had scored late in the game, and perhaps, gave themselves a chance at winning. Following consultation with the sideline referee, the main referee blew his whistle and killed the Stingers late-game rally. The Stingers’ final attempt at a try was shot down by the referees, who believed the Stingers did not tap the ball down in the end zone. Despite the loss, the Stingers’ attention quickly shifted to next week’s Canadian Interuniversity Sport National Tournament in Kingston, Ontario from Nov. 5 to 8, where Concordia will be the fifth-ranked team in the tournament. “Minus the penalties, which were ridiculous, I think we had a great game,” said tighthead prop Erika Ikonomopoulos, who teared up at game’s end. “If you think about it, from the starting of the camp to now, we’ve all as a team had our adversities, our learnings; our high points and our low points and this was the moment—despite the fact that it didn’t go the way we wanted it to. 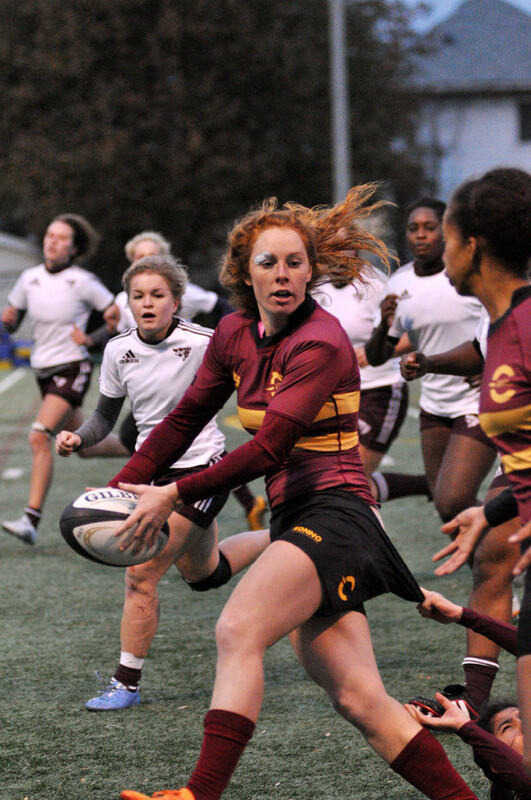 The Stingers quickly made their presence known by scoring the first two tries of the game, thanks to Rajotte. Ottawa, however, responded by scoring 17 points in the half, and took a 17-10 lead into the break. “We made three big mistakes, we gave their best player the ball three times and three times their best player scored,” said Stingers head coach Graeme McGravie. The Stingers scored another try in the second half, courtesy of Ikonomopoulos, but the Gee-Gees added eight points in the second half, including a try that gave them a 25-17 lead with two minutes left to play. “Our forwards were fantastic today, I thought when we had the ball our defense was great. We made a few mistakes on our kicks and that’s what we are going to work on this week,” said McGravie. With minor tweaks and less penalties taken, the Stingers felt the game could have been theirs for the taking, but Concordia is aware of the challenge that lies ahead, a chance at a national title. “The season is not over, we have other medals to win,” said McGravie. The Stingers will begin their quest towards a national championship on Thursday, Nov. 5 against the University of Victoria Vikes. In an earlier version of this article, it was written that the Stingers had tied the game at 17 points apiece thanks to Erika Ikonomopoulos. Concordia was in fact still down after Ikonomopoulos’s try. The Link regrets the error.